In August I conducted a lettering walk in Denver for TypeCon 2015. As part of my preparation I spent the day before walking and driving around the city. My chauffeur and cicerone was Diane Wray Tomasso, former New York graphic designer and Denver preservationist, an excellent repository of knowledge of the city’s architectural heritage past and present. One part of the city which we visited but which did not make it into the TypeCon 2015 lettering walk was Poets’ Row, the block of Sherman Street between 10th and 11th Avenues on Capitol Hill. Detail of James Russell Lowell apartment building (Charles Strong, 1936) 1020 Sherman Avenue, Denver. Photograph by Paul Shaw 2015. 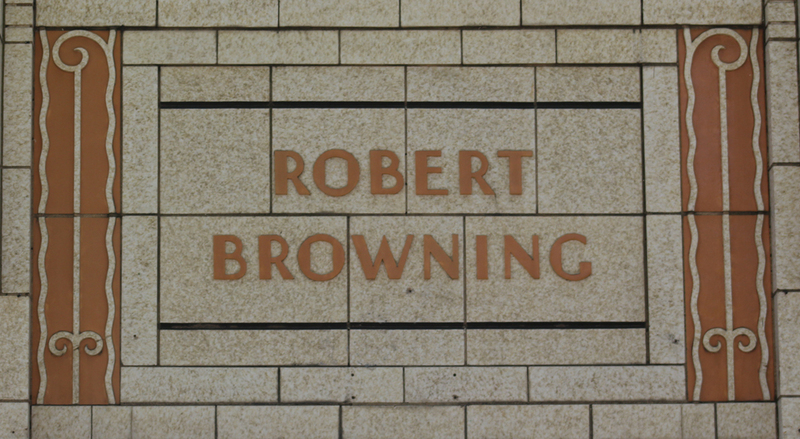 Detail of Robert Browning apartment building (Charles Strong, 1937) 1000 Sherman Avenue, Denver. Photograph by Paul Shaw 2015. The block is a bit of a misnomer as not all of the apartments are named after poets. The original 1930s named buildings are, in alphabetical order: Robert Browning (1000 Sherman Avenue), Thomas Carlyle (1010 Sherman Avenue), Eugene Field (1055 Sherman Avenue), Nathaniel Hawthorne (1045 Sherman Avenue), James Russell Lowell (1020 Sherman Avenue) and Mark Twain (1035 Sherman Avenue). They were all designed by Charles Strong. 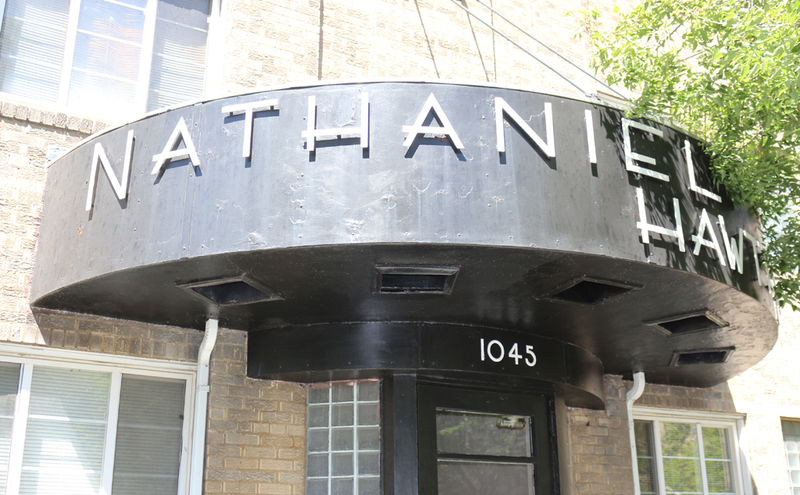 Other buildings on the street—not designed by Strong—have since been renamed to fit the literary theme of the neighborhood. They include two named after female writers (Emily Dickinson and Louisa May Alcott). Detail of Thomas Carlyle apartment building (Charles Strong, 1936). 1010 Sherman Avenue, Denver. Photograph by Paul Shaw 2015. 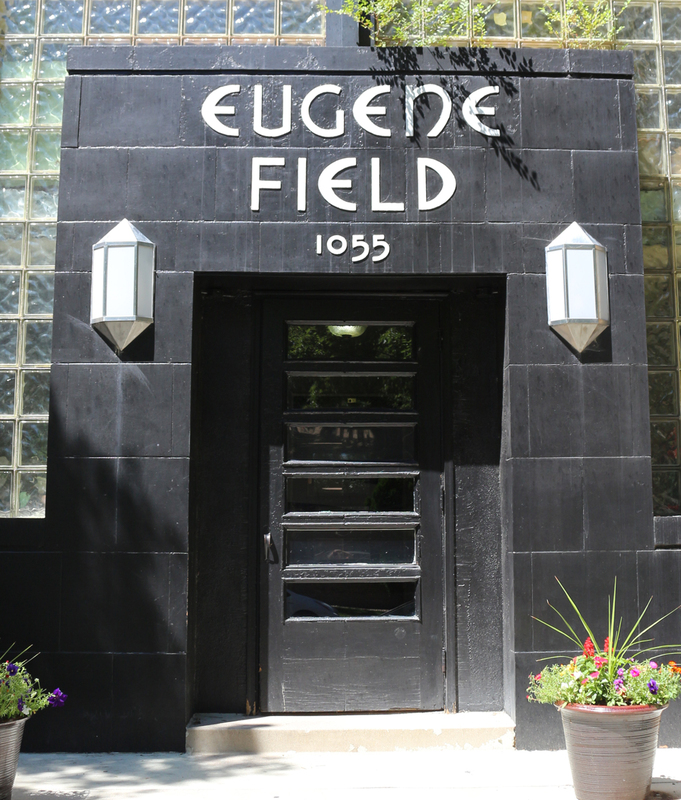 Doorway of Eugene Field apartment building (Charles Strong, 1939). 1055 Sherman Avenue, Denver. Photograph by Paul Shaw 2015. The Twain lettering is dynamic with descending M, the extension of the crossbars of A to the left, the unbalanced leg and arm of K, and the closely parallel left diagonals of W pulling the viewer’s eyes in several directions at once. 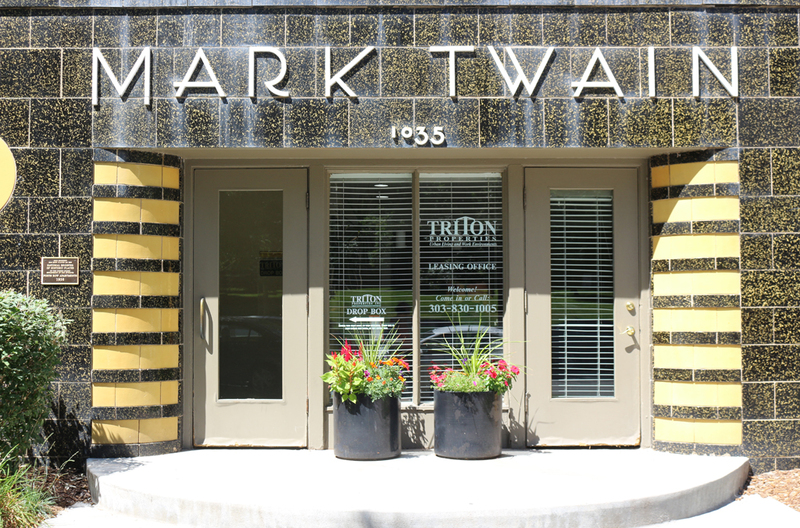 Entrance of Mark Twain apartment building (Charles Strong, 1938). 1035 Sherman Avenue, Denver. Photograph by Paul Shaw 2015. At first glance the Nathaniel Hawthorne seems similar with its loose letterspacing and extended crossbars on A and H. But at the right, hidden behind the foliage of the tree, is an R that is truly bizarre. Its bowl is nearly the full height of the letter and its leg is completely horizontal. Only context makes the letter identifiable as an R. It is a fantastic design, further evidence of the malleability of the Latin alphabet. Canopy of Nathaniel Hawthorne apartment building (Charles Strong, 1938). 1045 Sherman Avenue, Denver. Photograph by Paul Shaw 2015. 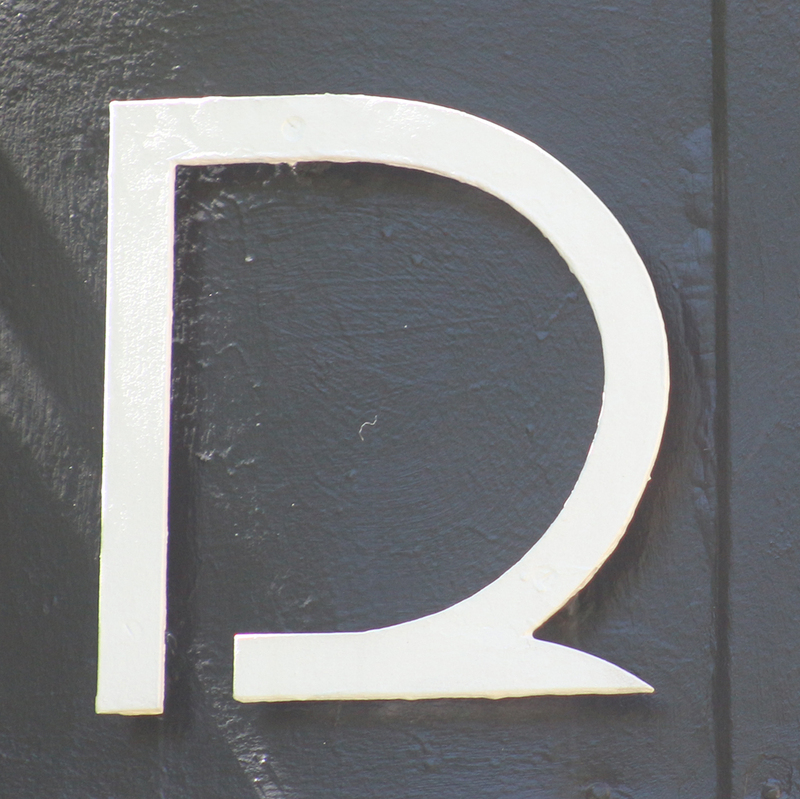 Detail of lettering on Nathaniel Hawthorne apartment building. Photograph by Paul Shaw 2015.